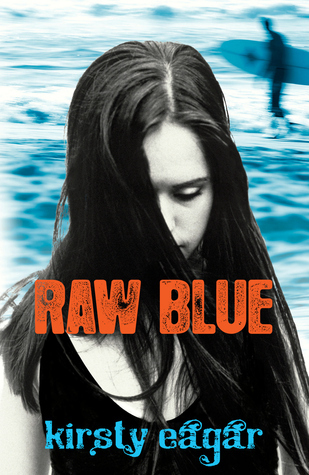 Raw Blue by Kirsty Eagar is a book published in Australia that I read for the The Aussie YA Book Challenge hosted by Nic of Irresistible Reads and Nomes of Inkcrush. I asked a friend to get it for me from Australia but I believe it’s available in ebook format in the US. Find out more from the author’s website. I believe I was interested in this book because Nomes of Inkcrush keeps recommending it. Carly has dropped out of uni to spend her days surfing and her nights working as a cook in a Manly café. Surfing is the one thing she loves doing… and the only thing that helps her stop thinking about what happened two years ago at schoolies week. And then Carly meets Ryan, a local at the break, fresh out of jail. When Ryan learns the truth, Carly has to decide. Will she let the past bury her? Or can she let go of her anger and shame, and find the courage to be free? Carly dropped out of university (they call it uni in Australia and we call it college over here) because she doesn’t see the point in it. Her father cuts her off and throws her out of the family house so Carly moves to Sydney where she can surf all she wants while maintaining a night shift job in a cafe. I’ve never tried to surf even though I know that it’s possible here in the Philippines. And I’ve never been to Australia either but I didn’t find Raw Blue confusing. Mostly because it’s about Carly and her way of trying to cope with her past by focusing on doing something that she loves, which I believe is a universal thing. I liked how Carly was so passionate about surfing, even going against her parents’ wishes to do what she loves best. She isn’t irresponsible because she’s supporting herself with her job. She’s not much of a social person but without her planning to, she befriends her quirky Dutch neighbor, Hannah, and fifteen-year-old Danny, who’s also a surfer and has a condition called synesthesia. Basically, Danny sees colors in relation to people and things. Such an interesting trait, right? Another person that suddenly just pops into Carly’s life is Ryan, a surfer who manages to be intense and laid back at the same time. I found the way that Ryan speaks, with “mate” thrown into a lot of his sentences, charming. I am loving the Aussie YA books that have been released recently and I know I’m not the only one. I see people on Twitter asking why some of the Aussie YA books that they want to read aren’t available internationally. I know I keep saying this but I want the same thing for Filipino YA – why can’t local authors produce books like this? This is a book about surfing, yes, but it’s also a contemporary YA novel that has a unique premise. It doesn’t occur in a school setting like other YA novels and the characters are older than usual. Carly is nineteen and Ryan is twenty-six (yay for YA characters in their mid-twenties). Raw Blue is full of emotion but I was never overwhelmed because it’s not all pointless teenage angst. You can feel Carly trying to hold everything together and how hard it is for her when things fall apart. She tries to channel everything that she feels through surfing because that’s her outlet. There aren’t any major changes that happen in Carly’s life throughout the book but Raw Blue is about dealing with the past and moving forward. Highly recommended for fans of contemporary YA and surfing. I’m now curious about Kirsty Eagar’s other book, Saltwater Vampires. Thanks Nic and Nomes for organizing the Aussie YA challenge! It has been so much fun reading good Aussie books. 😀 I really hope they all become internationally available so more people can read them. Brandy, you can read it in ebook format if you want. 😛 I feel the same way when I read see reviews of Aussie books in Aussie book blogs. After reading yours and Nomes reviews, I really want to read this now! Don’t know if I’d want to go the ebook route though. It really is a shame that Aussie YA books aren’t internationally available. I know there are some bookstores over there that have worldwide shipping, I think Nomes can recommend where you can buy copies? I love this review, Chachic! You are absolutely right; it wasn’t pointless teenage angst, but raw emotion, and how to move forward when you are so beat up by the past. Danny is precious, and yes, Ryan was quite charming. It would be great to see a lot more international titles readily available. Thanks for the compliment, Missie. “Raw emotion” is a good way to describe what Carly was going through in this book. I really hope Raw Blue becomes available internationally. I know that some Aussie titles have US or UK publishers.